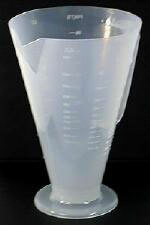 Getting the right oil-to-gas ratio is no problem with this tough polypropylene cup. Just fill the cup with oil to the ratio level desired, and mix with gasoline. Ratios from 16:1 to 50:1. Graduated in ounces and CCs for filling chain cases, etc. 18-ounce capacity.